Brand new townhome. Luxury townhome living that is both comfortable and convenient Welcome to the Bristol! This beautiful living space features 3 bedrooms and 2.5 bathrooms spread over 1732 square feet. 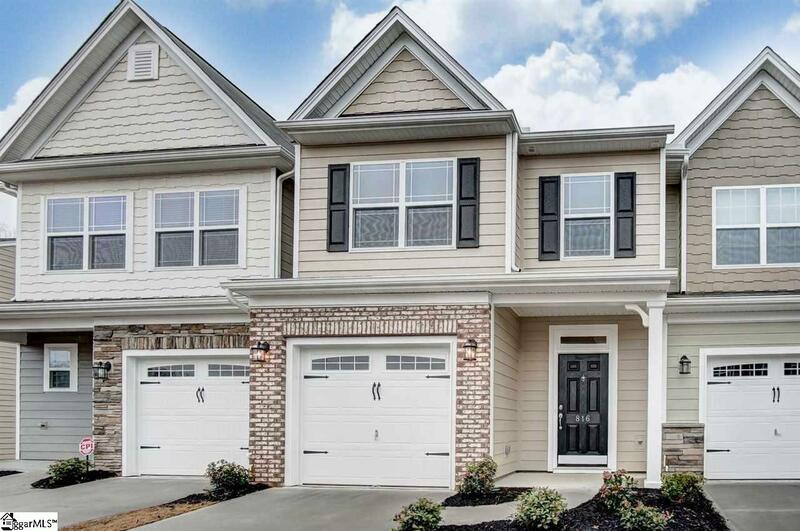 This townhome is nestled in The Village at Adams Mill community, just minutes from I-385 access and downtown Greenville. Coming through the front door into the foyer you will immediately notice the LVP hardwood flooring that covers the entire first floor. Just beyond this is the garage entryway and powder room, complete with an elongated toilet and cultured marble countertop. You will love the kitchen space that is both open and functional. Highlights include a large center island, granite countertops, stainless steel Kenmore appliances, pendant lights, all complete with a tile backsplash, and crown molding around the cabinets. Toward the back of this home is a gas log fireplace in the corner as well as sliding glass doors that lead out onto an extended 8 x 12 patio! Following the steps up to the second floor leads you to the two secondary guest bedrooms at the front of the house. Both rooms have full closet space and are immediately next to a full bathroom, also with cultured marble countertops. The hallway will lead you to a set of French doors that enclose the washer and dryer space, which is located just outside of the master bedroom. The master bedroom and kitchen are the two highlights of the Bristol! This master features a tray ceiling, a bathroom with a double vanity and cultured marble countertop, LVP flooring, and an enormous master walk-in closet. This home sits on a lot that is fully maintained and is situated centrally in the neighborhood. This home is a must see!